The rising cost of shipping is on sellers' minds as new 2016 postal rates took effect on Sunday. Some sellers fumed over the fact that the US Postal Service provides special rates to China Post and other Asian postal services that make it cheaper for Chinese sellers to reach US buyers for lightweight packages than for domestic sellers. It's an issue we've been writing about for a long time, and we've been digging into it again this week as we also keep up with Sunday's rate changes. "How much does it cost to send an 12 oz. e-Packet from Beijing to Los Angeles," a seller asked. "I'll bet it cost less then the same package going across the street to my neighbor. This is where I have a problem!" Another reader pleaded with us to publish the ePacket rates in a chart side by side with the rates they pay to compare them in black and white. In October, the USPS told us, "The countries that have ePacket agreements with USPS are China, Hong Kong and Korea Post. We are unable to disclose rate information as it is commercially sensitive information of the USPS and foreign postal operators." 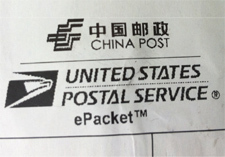 We asked the USPS again this week for the newly negotiated (October 1, 2015) ePacket rates with China Post, and received the following link to rates found on Chinese-language China EMS website. As it happens, Internet Retailer published a chart this week that shows a Chinese merchant can ship a 1.8 ounce package for $5 to the US with basic tracking through ePacket with a delivery time of 7 - 10 days. That compares to a basic China Post Airmail rate of $2 with no tracking and an express 2-5 day delivery with advance tracking from FedEx, DHL, or UPS for $40. In June, when Amazon complained about ePacket rates to a Congressional subcommittee, we exposed the culprit: terminal dues, which are governed by the Universal Postal Union that sets "last mile delivery" rates between international postal services. As Kenneth Corbin wrote in that article from June, "The Postal Service has said that it is trying to press for a better ePacket deal with China, but that its leverage is poor, given that China can always scrap the bilateral agreement and allow rates to revert to the more favorable UPU terminal dues." He followed up with another article in December citing a report by the USPS Office of Inspector General (OIG), which also took issue with the ePacket product. So what can be done about terminal dues set by the UPU, which is set to meet in Istanbul this fall? Will anything be done soon to change a system that the OIG says puts small U.S. sellers at a competitive disadvantage? Based on our initial research, the answer to the latter question is probably not. Expect to see more coverage on this issue as we continue reach out to experts and gather more information. >In 2013, the USPS raised international rates by 56%. The united states biggest export is money. Think for a minute if the international shipping rates went down to 50 cents an ounce. There might be a huge demand for things no longer in demand here, but might have a following overseas. That owl figurine from the 70s? Maybe its worth $10 here, but $35 overseas. Lets say it only costs $3 to ship to Australia. There is going to be a lot of small time sellers bringing tons of money into the USA. What happens when people without a lot of money suddenly get more? They spend it.Then our economy improves. Thats exactly what China is doing. Most of those sellers won't even ship to China. its cheaper for them to ship elsewhere. Bring foreign money into your own country and things improve. Is is truly sad and alarming that USA sellers are not able to compete for international sales with those very high prices, I have great rates for DHL and Fedex but were too high in comparison with the inexpensive items we sell, still is and USPS was the only way we were able to compete, not anymore. I'll be promoting this ecommercebytes link and article to many people running for office, this is really a big issue. If the USPS has to increase rates, ok, but it as to make it just as hard for China sellers to flood the market with super cheap stuff at very low postage prices. Does not take 2 brain cells to know that this is very bad for the economy. Thank you Ina for this great article. The only people that should be affected by the rate increases are the BUYERS. The biggest reason sellers from China thrive is because of those that continue to buy from them. Maxmad admittedly buys 100's of item for these sellers. And I know I've been at fault for it in the past. Not anywhere near maxmad's level, but I did buy some things. I've since stopped. This is part of the problem. Certainly not all of it, but it is a huge part. As long as China has a market here, they are going to do whatever they can to keep the sweet shipping deals they get through USPS. But if the market dried up for them, then there would be no need for an agreement with USPS. Well, this is what happens when country policy helps strengthen an entity that outmans us by a 4:1 ratio. Maybe it's reached the point where America no longer has a choice. Ancient Rome had begun bribing, prior to their fall, too. I think, that EVERYONE needs to send a letter to the Post Master, and figure out how to beat the system if possible, and STOP BUYING CHINESE PRODUCTS!!!! Even if I added up everything I have purchased from China e-packets in my lifetime it wouldn’t even come close to what companies like Wal-Mart buys every second of the day. Marie, I am fine with you picking on me, I understand that, but We are all guilty of it, every single one of us, why? because we wanted cheap stuff, and corporations wanted more profit, sent all our manufacturing technology to china, and now we have very little options, but to buy from them. I mean seriously I can't even turn on the lights to my shop, for the cost of finished goods delivered from china !! e-packets are nothing, they are a very tiny drop in the bucket, of what has been really going on, it’s just now starting to affect a lot more different livelihoods, like it did mine 20 years ago. You would have to be living in a bubble to think you could get by without china, most people would be running around naked without shoes, best advise to young people, learn to speak and read Chinese. So, US taxpayers who subsidize the USPS's losses have no right to know what kind of a deal they're cutting the ChiCom's? I think its very unfair to all. Out of the last 5 packages I had sent to me , 2 made it , 2 were destroyed , 1 missing. I cant even imagine adding china to it. USPS is by faR THE WORST these days. I am at my wits end with them & their overpriced crappy service. I didn't say you weren't a hard working soul. Nor was I trying to "pick" on you. I restated what you had said regarding your purchases from sellers in China. Nothing more and nothing more was meant. You were merely an example. It is supply and demand. As long as they have a good amount of customers, they will continue to sell on Ebay, Amazon and the like. That was my point, NOTHING more. Its insane and makes no sense. Ever notice that whoever first comments on one of Ina's topics pretty well sets the tone for the entire string? Even with $20 items the Chinese Seller will whine about not making any money sending replacements for defective or incorrect items - more ISNAD. One Chinese Seller used epackets to send me 3 different ''NEW'' Sony TV Remotes [that were originally Made in China by Sony] but none matched the Item Photos or the descriptions. Needless to say none worked with my Sony TV either. Yet the Chinese Seller whined that he couldn't make any money continuing to send me the wrong items. ha ha ha Me neither! After 3 months I resold each of his $10 ISNAD remotes for $30 and a handsome profit and sent him his advertised eBay price of $10 each. $30 is about what I paid the USA Seller for the correct Sony Remote. What's my point? That epacket prices won't improve the dodgy products that are shipped out of China. None of my Australian Buyers will even look at an item offered by a Chinese eBay Seller. Regardless, purchases made from China are still a crapshoot. Low ePacket rates and ridiculously low priced items usually mean IMO receiving junk. Keep gambling and spinning the wheel and maybe, just maybe, you will win what you are looking for. How many spins did it take and how much of your time did it waste? It does appear the quest to buy cheap junk is waning here in the USA. Why else would Walmart be closing hundreds of stores and China wanting to start producing better quality goods? But do Americans have the money to buy those goods? This ePacket USPS rate ''gifted'' to China WILL destroy small businesses not only from growing their business outside of the US but domestically as well. Is there any entity in power out there to stop the US economy from floundering? The fact that the USA owes China over a trillion dollars may be a big part of this. China's economy is tanking, and they want their money back. ''DAVOS, Switzerland — At the World Economic Forum here, chief executives and investors are blaming China for a slump in global markets. The financier George Soros said at a dinner on Wednesday night that a “hard landing is practically unavoidable,” adding that China is the root of the current financial crisis.